1. In 415-acre Bill Baggs Cape Florida State Park, four miles of trails course past a subtropical forest of gumbo limbo and pigeon plum trees and mangrove wetlands that once flourished in Florida. You're bound to spy numerous butterfly species and maybe even a rare peregrine falcon. 2. The two-mile Fossilized Reef Trail winds to a unique geological feature -- visible at low tide -- at Crandon Park's Bear Cut Preserve. On the way, you'll likely encounter a variety of birds, from white ibis to cormorants. 3. Just 20 minutes from downtown, Oleta River State Park is a perfect venue for kayaking along the mangrove-lined Oleta River. This is also one of the state's best spots for mountain biking with some 14 miles of interconnecting single track beside waterways where you may spot dolphins or manatee. 4. At the Deering Estate -- once owned by philanthropist Charles Deering -- naturalists lead treks into a tropical forest where you’ll see a Tequesta burial mound from 10,000 years ago, an avocado tree grove from the 1930s, and a solution hole where they found wooly mammoth and campfire evidence from Indians 10,000 years ago. Guides lead numerous other treks, including bird and butterfly walks. 5. Villa Vizcaya, a land of excess owned by Charles's younger brother, the industrialist James Deering, recreated a 16th century Italian villa with rooms filled with European furnishings from the 16th to 19th centuries. 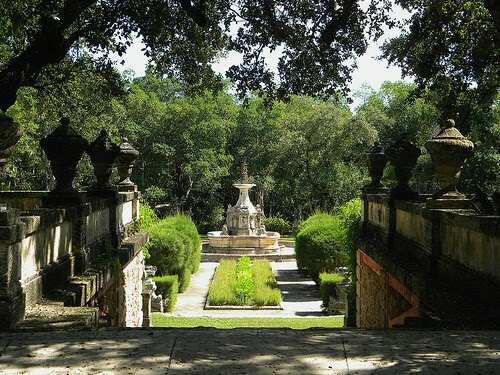 The gardens, however, are the highlight of the estate with elements of 17th century French and Italian landscaping. Here you can spend half a day roaming the 10 acres dotted with lily ponds, cascading water, topiary, even a maze garden, and stone grottos. 6. Set on some 83 acres, the Fairchild Tropical Botanic Garden is home to a lush rainforest, the largest such outdoor forest in the continental U.S. More than 200 plants from the Caribbean, South America and Asia can be found on this property, including unique specimens, such as the rainbow eucalyptus with its colored trunk; and the powderpuff tree, candy corn vine and petticoat palm -- you won't wonder how each received its name. 7. You'll have a whole new perspective on plant life after visiting the Fruit and Spice Park. The park is noted for many unique species, including the lipstick tree, which is considered the poor man’s saffron, and the custard apple that has black fleshy fruit. This is a very interactive park where visitors can sniff bay rum leaves, and sample jackfruit, guava, chocolate pudding fruit and sapodilla. These all sounds lovely. I have to admit I didn't like Miami much when I was there, maybe if I had visited these places I would have! I've been dying to go to Miami. I have a friend who lives there, and I've heard there's actually some good camping nearby. I am adding all of these suggestions to my to do list so when I finally get to Miami I can visit all these places! Thanks for the lovely list. Lovely. I always think of beaches in connection to Miami, but it makes total sense that there'd be lots of natural areas like the ones you've described. Beautiful. Thanks for the fantastic suggestions. I was delighted to find all the wonderful State Parks and Nature Preserves when I visited Orlando years ago. And of course Miami is also only a hop skip and jump from the Everglades. I'd love to visit the places you mention,much more than the flash of Miami's nightlife. I'm definitely not the clubbing type, so I've never put Miami high on the travel list (although I have been to the Vizcaya for a work event - gorgeous!). I'd love to see a manatee swimming along, so maybe I WOULD enjoy a trip there. Hi NoPotCooking, I wasn't the biggest fan of Miami either until I discovered its green side. Hi Jennifer, That's excellent that you have a friend in Miami. And, yes, there is some fab camping there as well. Hope you get to visit even some of these sites. Hi Jane, For sure, Miami is synonymous with beaches. But it's always nice to find sites beyond the expected or the obvious. Glad you enjoyed my suggestions. 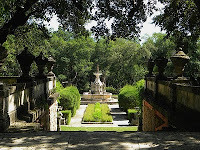 Hi Vera Marie, Oh, yes, Orlando has some amazingly beautiful parks and gardens as well. It's funny: when I was last there, even the concierge at my hotel had no idea about any green spaces in the city. Go figure. Hi Casey, I think you absolutely would love a trip to Miami. As long as you have a car you can easily get to all these sites. I've been to Miami many times, yet never knew about any of these treasures. Next time I will definitely have to get off the sand and onto some greenery. Thanks for this great guide. Hi Sheryl, Glad you enjoyed my green space tips. Miami's a funny place: unless you're looking for the parks and gardens, they're not that easy to find. I made a deliberate effort to research green spaces before I arrived. Well worth the effort. I've only ever been through the Miami airport. Right now ti's been snowing where I'm at for days--the idea of visiting Miami is heavenly. Thanks for this. I've never been to Miami, but it's always seemed like a fun place to visit. Thanks for this info! Hi MyKidsEatSquid, I also would love to be in Miami right now, given that it's snowy and freezing here in NYC. Hi Susan, Miami is very fun and it's nice to have such a wonderful mix of a creative culinary scene, vibrant clubs and bars, as well as these tranquil green spaces. I spent a few days in Miami a few years ago - this is definitely not what I saw! These sound like great places to take note of for a future visit. Hi Kris, The first few times I visited Miami years ago, I never saw these sites either. This time I was determined to find low-key, non-beachy sites. It's amazing that Miami has a wealth of them once you start hunting them down. I would love to take a trip to Miami and spend some time exploring.Being on the west coast we don't think about going there as much as relatives who live back east do. But it really does sound lovely. Hi mjr, I completely understand. It's a long flight from the west coast. Here, in NYC, we would just fly down to Florida for a long weekend. But you've got so many loves green spaces on the west coast, as well. Great ideas for visiting Miami's natural side. These are just the type of activities I like to build into a vacation. Thanks! Hi Donna, Glad you enjoyed my suggestions. Finding the natural side of an urban area is one of my favorite things.